The uppermost Northern Hemisphere, North America, Europe, and Asia have significant expanses of land. The boreal forests ring the regions immediately south of the Arctic Circle in a vast expanse that easily rivals the rainforest regions of the world. 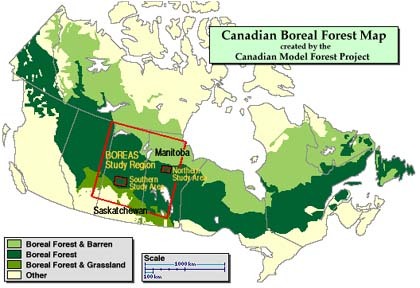 The northern boreal ecoregion accounts for about one third of this planet's total forest area. This broad circumpolar band runs through most of Canada, Russia and Scandinavia. 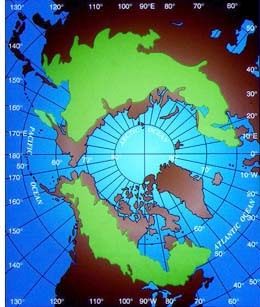 North Pole. Map source, Hare and Ritchie (1972). mil. sq. mi. mil. sq. mi. * Conical shape - promotes shedding of snow and prevents loss of branches. * Needleleaf - narrowness reduces surface area through which water may be lost (transpired), especially during winter when the frozen ground prevents plants from replenishing their water supply. The needles of boreal conifers also have thick waxy coatings - a waterproof cuticle - in which stomata are sunken and protected from drying winds. * Dark colour - the dark green of spruce and fir needles helps the foliage absorb maximum heat from the sun and begin photosynthesis as early as possible. Although the population in this ecozone is relatively sparse, there are many small communities which rely on various resource extraction industries such as forestry and mining. Unless they diversify, their existence is extremely tenuous, often relying on one mill or mine as their economic mainstay. For generations, the boreal forest has also been home to First Nations people including, in North America, the Cree, Innu, Mˆmtis, Dene, Gwich'in and Athabascan. Traditional Aboriginal lifestyles are also deeply tied to the continued existence of wildlife.